A rendering of the Trump Ocean Club project in Panama City, Panama. Donald Trump has never been accused of subtlety. So there is nothing retiring about the celebrity real-estate magnate's venture into Panama. His 70-floor sail-shaped Trump Ocean Club, under construction in Panama City's exclusive Punta Pacifica district, will be the largest and most expensive building ever built south of the Rio Grande. "Nothing like this has ever been attempted in Latin America," says head developer Roger Khafif, whose K Group construction firm is handling the $400 million project. "When you think of Sydney you think of the Opera House, when think of Paris you think of the Eiffel Tower, and when you think of Panama, you are going to think of this building." The 1,080-unit building's construction has now reached the 62nd floor and is scheduled to be inaugurated by the end of the year, complete with luxury condos, a five-star hotel, six restaurants, a Las Vegas-style casino and a private yacht club on the nearby Isla Saboga. 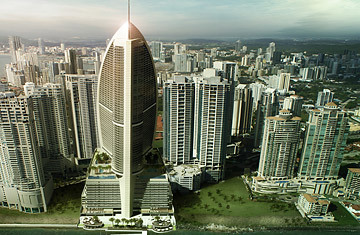 The project is 10-to-20 times more expensive than that of any other skyscraper in Panama City. It will be 20% bigger than the AOL-Time Warner building in New York City, Khafif says. Khafif says Trump's name will help the country's image makeover. "Before it was Panama and Noriega," he explains, referring to Manuel Noriega, the notorious general who ruled the country from 1983 to 1989. "But now it will be Panama and Trump." Or at least he hopes so. "We bet $400 million on it," Khafif says. If Khafif sounds proprietary about something with Trump's name on it, it's because the project was his idea in the first place. When the Colombian-born developer came up with the plans for the building in 2005, amid Panama City's real-estate explosion, he realized it was too big to be financed without a major-league brand name. Khafif knew that Trump had been in Panama in 2003 for the Miss Universe Pageant, so he asked a mutual friend to set up a meeting in New York. "I know the guy has an ego and likes pretty things and, boom, Panama is exploding. So baby, if there's any right time, this is the right time," Khafif recalls, explaining the spirit in which he approached Trump. The meeting happened in 2005 and Khafif said he was surprised to learn how much homework Trump had done beforehand. "He had done a lot of due diligence. That's what let me walk through that door; it's not easy to walk through that door," Khafif says. Trump "already knew that the country was booming," but "hates to fly or leave the country." The day after the meeting, Khafif said he received an early morning phone call. "I hear a voice that sounded like Trump, but I thought it was friend who can imitate voices. Two minutes later I realized I was talking to the real thing and I had to apologize," admitted Khafif, who speaks in a quick and seamless flow between Spanish and English, oftentimes switching languages several times in the same sentence. Trump, perhaps accustomed to telling people it's him and not an impersonator on the phone, told Roger, "I love it and I am going to send Ivanka down." Ivanka is Trump's daughter by his ex-wife Ivana. The young woman is now the company's executive vice president of development & acquisitions, and keen on bringing a more global vision to the family business. The next week, Ivanka visited Panama City and liked what she saw. "Panama is a spectacular, thriving country, changing by the day," Ivanka told TIME in an email. "It's been amazing for me to see the growth of Panama City first hand." "She's a very intelligent young woman," Khafif says. "Sometimes I think she's even smarter than her dad about certain things." The contract was signed and the project was launched in New York City in 2006  the same day authorities back in the Latin American nation announced a dramatic $5.2 billion expansion of the Panama Canal. More expensive than Miami real estate and priced three-to-eight times higher than property in the rest of the Panamanian market, the Trump Ocean Club is partially financed by a $230 million bond offering from Bear Sterns. That bond is now being handled by JP Morgan following the collapse of Bear Sterns in the 2008 global financial crisis. "Without Trump, we would have lost our shirt," Khafif admits. Since then, more than 2,000 construction workers add a new floor each week, silencing many of the earlier skeptics who claimed the project would never get off the ground. But some doubts remain. Eric Jackson, owner of the English-language Panama News thinks that many of buyers in the Trump Ocean Club, which claims it is 90% sold, could be speculators rather than future tenants. "You go around Panama City and look at these new 'sold out' luxury towers at about 8 p.m. and there are hardly any lights on in them," Jackson says. Samuel Taliaferro of the PrimaPanama investment blog agrees. "I have received emails from a number of speculators who never intended on taking possession." But realtors say Panama is just the type of image-crazed country where people will put up with traffic problems in order to boast "Trump" as their address. Kent Davis, owner of real estate agency Panama Equity, says that even the neighbors are excited about Trump. "It's not like having Wal-Mart move in and force out the competition. People are psyched to have Trump in the neighborhood. I even sold a property in a nearby building because the buyer was excited about using the Trump facilities." See 10 perfect jobs for the recession  and after. See the top 10 crooked CEOs.